Please click here for the 2016 Second Quarter (Apr. - Jun.) Louisiana Timber market report. In this document you will find information on the outlook for important wood products and the stumpage prices of major timber product classes for the prior three months. Forest landowners and other forest stakeholders may find this information helpful with making financial decisions regarding forestry markets. 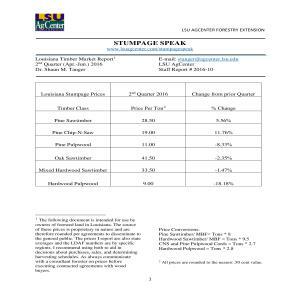 Please contact Dr. Shaun Tanger (stanger@agcenter.lsu.edu) with follow up comments or questions.